We love heroes and our Edmonds community is blessed with an abundance of them. These heroes don’t wear capes or swing from building to building. They are content to quietly serve our community with a steadfast duty to unselfishly help others. 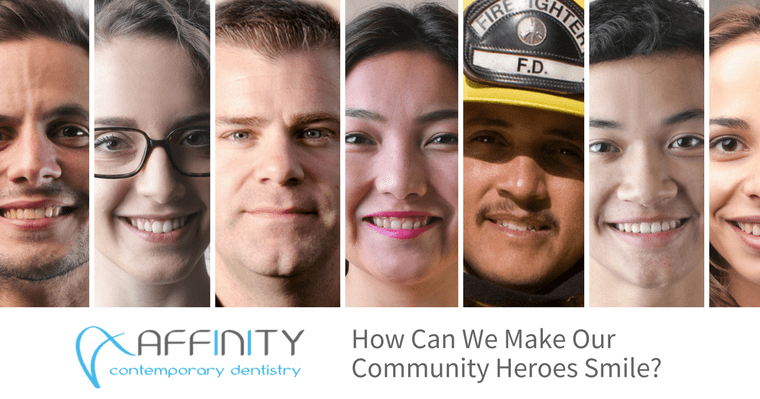 At Affinity Contemporary Dentistry, we want to give back to our police officers, firefighters, teachers, and other public servants who work behind the scenes in our community by helping them smile brighter for a lifetime. Your Edmonds dentist works hard to ensure that all members of your family, from little ones to grandparents, have the chance to have a life-long healthy and beautiful smile. We all know the saying: “An ounce of prevention is worth a pound of cure.” What kind of preventative measures can you take to maintain your oral health? A daily oral hygiene routine — Nothing can make up for a good at-home dental routine. Brushing and flossing your teeth at least twice a day will help remove plaque which can build up to cause cavities and gum disease. A healthy diet and lifestyle — Drinking plenty of water and limiting foods high in sugar and carbohydrates is a good place to start to minimize cavities. Quitting smoking will not only benefit your overall health but your teeth and gums will thank you too. Regular dental visits — Seeing your dentist every six months for a check-up and cleaning is vital to maintaining oral health and preventing costly repairs. What if it’s been awhile since you’ve been to the dentist? Thanks to modern techniques, like comprehensive dentistry, it’s never too late to start improving your oral health. Comprehensive Dentistry is a way of approaching oral health with the understanding that our teeth and gums are part of our overall health. By proactively taking care of your oral health, your dentist is better able to prevent larger and more complex issues down the road. Cavities and periodontal disease are preventable with early and simple intervention, such as periodic check-ups and cleanings starting in early childhood. Not everyone likes going to the dentist, but as dental technology has evolved, so has our ability to prevent, diagnose, and treat oral disease with less invasive procedures and less discomfort. 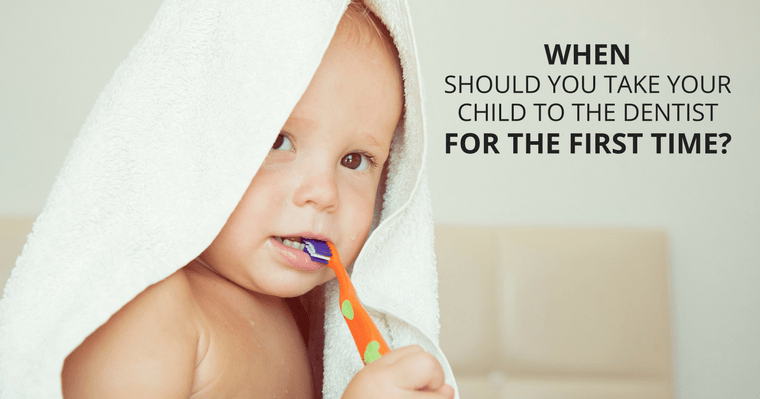 It is recommended that children start seeing a dentist for a check-up by the time their first tooth erupts. Bite issues — could a misaligned bite be causing premature wear of your teeth? Gum problems — do you have early signs of periodontal disease? Seemly unrelated concerns — if you suffer from migraines, snoring or jaw pain, could they have a dental cause? Making an appointment with your dentist should be a time not only for cleaning and maintenance but also to re-assess your overall health and oral situation. By intervening early, we are able to prevent future problems, such as missing teeth or root canals from cavities that advanced too far. Preventive dental care is far less expensive than the treatments that may be required to restore your smile. In the long-run, you’ll spend less time away from work and in our dental chair. A beautiful smile is your greatest asset and attractive at any age. You’ll never regret taking care of your teeth and gums to retain their look and function. It’s never too late to get a confident smile. Learn about our cosmetic dentistry treatments. Did you know that maintaining excellent oral health keeps your teeth AND your overall health in optimal condition? That’s right. Your oral health directly affects your overall health. Studies have shown that dental conditions (such as gum disease) can increase your chances of serious ailments, such as heart disease, diabetes, and much more. Many who work in civil service constantly put aside their own personal needs to serve the public. They may put their lives at risk to keep us safe and secure or work tirelessly to inspire our future leaders. Dr. Youssef wants you to join us in saying thank you to these public service heroes. Do you have a personal community hero? Make sure to share this special gift with them!